PLEASE, make sure you read EVERY WORD on this page! Many people have contacted me over the months about their desire to become authors. Most of them have utilized the tips I gave them and today they have published their books. Even though the process of getting a book published looks really complex, it is not all that complex after all. This is why I am offering to break it down for you during this writing course. One of the quickest ways to learn is to copy what other successful people are doing. Then take that process and make it your own. That way, instead of taking a year to write and publish something – and possibly even longer – you can accelerate your progress and hit your goals in a fraction of the time. You should take this course if you love to write and be writing but you are stuck; you are held down by fear, procrastination or lack of inspiration; you desire to become an author and get your book published soon enough. I want to challenge you to get rid of your fears and turn your dream of becoming an author into a reality. I want to show you that you can surmount anything that has been holding you back from achieving your goal. I published nine (9) good books in fourteen (14) months and I have sold several hundred copies of my books with all of them on Amazon. I am not handing you a magic bullet. No. I want to show you what’s worked for me and trust that it will work for you too. • • • You don’t have to wait any longer, give me your hand and let me lead you through this. HEAR FROM SOME FORMER PARTICIPANTS. . . 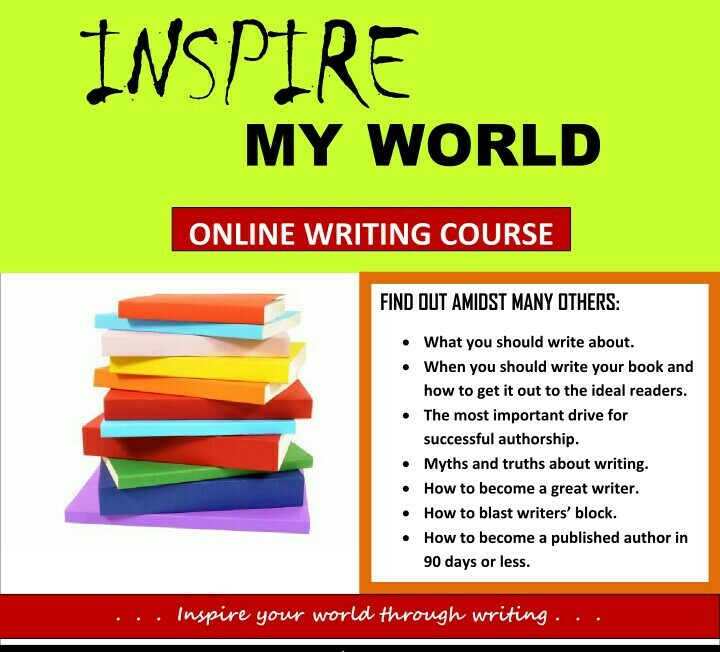 I could have ordinarily been a wandering writer without direction but luckily for me, I came across inspire my world writing course by Dr. Omolola Omosebi. This course is likened to one being taken by hand through the fundamentals of writing (easy to understand and practical oriented). The modules are so loaded that you would want to watch (video) or read (handout) over and over. The flow and simplicity of the words makes it amazing. The lecture notes is cherished as it is handy and a sure guide anytime you needed to get an information about writing. The bottom line is that after I had gone through this lectures, I can boldly say I am an authority in the field of writing having authored two books within a space of two months interval. I can’t tell it all here but would only ask you to get on board, catch the fire, get inspired and inspire others. This is not a training you wouldn’t want to recommend to others after going through it. I strongly recommend it for you. My writing issues were really dealt with. Thank you, especially for Module 2. What an eye-opening course. These modules have really stirred up my spirit, not only in writing aspect but in all aspects of my life endeavors. I must confess, the series worth the cost. I actually downloaded to enable me listen over and over till they really sink (you know). Funnily, I presently have about 22 topics I have been inspired to write on with a brief on each in my note but I had been unable to focus and complete any. Two major hit modules for me are modules 4 (motivation to write) and 5 (writers block). Also, your words about effective time management. These are the three areas of my struggles when it comes to writing and you did justice. Also, I always felt I needed more inspiration and time to write and do a good job, but you really made it simple in module 3 and make me believe it’s all about me. I believe a seed has been sown and I hope to do you proud soon. It’s actually a wonderful but rare privilege to have such rich contents of the course. The writing course was totally worth the while. I so much have now what is sufficient for book writing and even publishing. Module 3 in particular was really inspiring for me; top notch. The beauty of this module is that it’s not applicable to ONLY book writing. It’s applicable to life generally. I would recommend the course anytime to anyone. It will make anyone better. The assurance of assistance via Hill City Publishers is indeed another motivation for me to start writing immediately. God bless you real good. Well-done for this great job. The exercise was a carefully prepared training, I was blessed from start to finish in an irrecoverable manner. It’s been laid on mind to reach out but I’ve always thought it difficult until after taking the course. I minister to Teens and single women. I often feel like writing but thought I couldn’t until after the course. I’ve been ministered to, i can say that I’ve been healed and blessed. Thanks a million times. I appreciate and celebrate the Grace of God on your life & ministry. So proud to be associated with you. This course will not be free (I would have loved to make it so) but it is totally affordable. I want you to be committed to this process and paying for it will help make sure of that (sole reason I am asking you to make an investment). This is therefore totally for your good. • • • You will have access to all modules of the course (about 4 hours of videos), comprehensive downloadable notes and worksheets (the access is for longer than four (4) weeks but I recommend you get through the course in 4 weeks while your commitment is in high gear) right here on this website. • • • Taking this course will also automatically give you direct access to a boot camp (which will commence immediately after the course period lapses) where you can be monitored to implement all that you learn during this course. The BOOT CAMP will serve as an accountability centre and that gives you direct access to me. • • • You also get free consultation courtesy HILL CITY PUBLISHERS for your book publishing. You get access to information needed to see your book through all the publishing stages especially if you will love to take the route of self-publishing, so that you don’t fall victim to dubious publishers out there. You will still have to do your part. But first, let me let you in on the realities of publishing a book. I want to pour all I know into seeing your dreams fulfilled. I want to show you how to maneuver the turns and bends with ease. . .
• You can actually have your book published in 90days or less. • You can publish your book at the lowest cost possible. • You can overcome the hurdle of getting a publisher for your book. • You have an audience for what you have to offer; you can fine tune it. Or build one from scratch in a short while. DO YOU WISH TO TAKE THE COURSE BUT CAN’T AFFORD TO PAY FOR THE COURSE AT ONCE? WANT A PEEP INTO THE COURSE?